Night Stands There are 84 products. 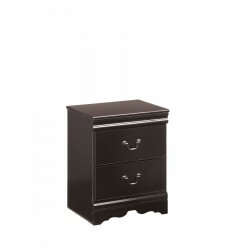 A nightstand dressed to impress with wonderfully rich details made comfortably affordable. Glossy faux marble top is simply over the top, while rope twist accents and bail pulls in a satin nickel-tone finish make for a beautifully coordinated ensemble. This nightstand is the epitome of traditional decor. Louis Philippe-style moulding dates back to the mid-19th century when furnishings were lavish yet somewhat simple. Deep finish brings warmth and elegance into the space. 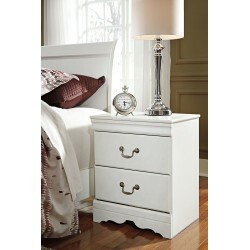 This nightstand's crisp cottage white gives traditional Louis Philippe profiling a delightful style awakening. The look is timeless. The feel? Right at home. Two smooth-gliding drawers with antiqued bail pulls beautifully accommodate. This nightstand is the epitome of traditional decor. Louis Philippe-style moulding dates back to the mid-19th century when furnishings were lavish yet somewhat simple. Luxe finish adds a slightly modern touch. Clean and simply beautiful, this nightstand sets the standard for versatile, vintage-inspired style. Though designed to look like a two-drawer piece, a single deep drawer provides plenty of storage potential. Open cubby provides pretty display space, while pewter-tone knobs are a sophisticated finishing touch. This nightstand combines the very best of traditional style. Faux stone top, antiqued finish, ornate hardware and scroll moulding make for a richly coordinated ensemble. It's hard to say what stands out most about this nightstand. Glossy finish, silvertone scroll moulding, faux marble top and intricate handles are all shining stars. A bright addition to traditional or Hollywood regency decor. It's fair to say this nightstand blends the very best of traditional style. Faux marble top, ornate hardware and ornament with scroll details are all classics in their own right. This nightstand is turning heads with its clean, streamlined vibe. Dark brown finish has a gorgeous distressed effect, adding two-tone visual interest. Large drawers provide a ton of space for your belongings. Knobs and pulls with satin nickel-tone finish give this nightstand a neat touch of shine. Get the look of posh barn wood without setting foot in a salvage yard. 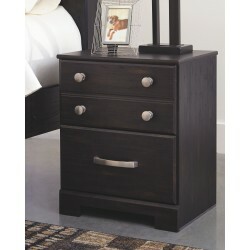 Replicated rough-sawn oak of this nightstand has a vintage finish that is reminiscent of a timeworn family heirloom. Warm, rustic and naturally beautiful, it's just got that ageless appeal. Sleek hardware in a pewter tone is a snappy finishing touch. A bright finish and clean lines allow this nightstand to fit with many types of decor. Though it's classic contemporary, it's also right at home among shabby chic and vintage furnishings. Two ample drawers provide plenty of storage. A dark finish and clean lines allow this nightstand to fit with many types of decor. Though it's classic contemporary, it's also right at home among vintage furnishings. Two spacious drawers provide ample storage space. Snappy satin-nickel-tone knobs are a crisp complement.